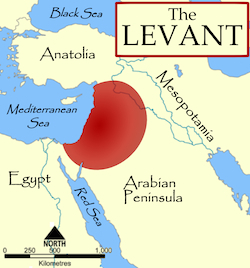 Judaism is a monotheistic religion that emerged with the Israelites in the Eastern Mediterranean (Southern Levant) within the context of the Mesopotamian river valley civilizations. The Israelites were but one nomadic tribe from the area, so named because they considered themselves to be the descendants of Jacob, who changed his name to Israel. Judaism stems from a collection of stories that explain the origins of the “children of Israel” and the laws that their deity commanded of them. The stories explain how the Israelites came to settle, construct a Temple for their one God, and eventually establish a monarchy—as divinely instructed—in the ancient Land of Israel. Over centuries, the Israelites’ literature, history, and laws were compiled and edited into a series of texts, now often referred to in secular contexts as the Hebrew Bible (or Tanakh in other contexts), written between the eleventh century B.C.E. and the sixth century B.C.E. (although the stories it contains may be much older). The Hebrew Bible (or Tanakh) contains three major sections: the Torah, or Five Books of Moses, the Prophets, and the Writings. An oral tradition emerged alongside the written Bible. 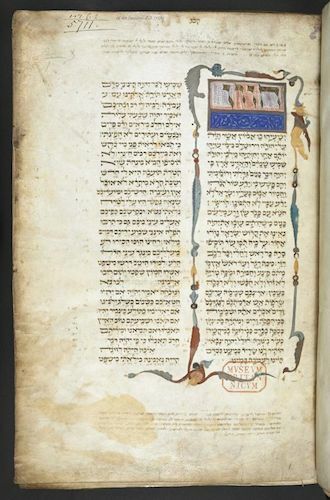 Sometimes called the “Oral Torah,” the Mishnah is a minimalistic set of debates attributed to the great religious scholars, or Rabbis, transcribed and published in the second century C.E. The Rabbis’ intellectual descendants recorded and expounded upon the Mishnah in a series of writings called the Gemara and later generations compiled the Mishnah and Gemara into the Talmud. Relief depicting a triumphal procession into Rome with loot from the temple, including the menorah, panel in the passageway, Arch of Titus, Rome, c. 81 C.E., marble, 6’-7” highWhile the Hebrew Bible is Judaism’s most sacred text, many of the laws it delineates concern the practice of Temple sacrifice and priestly behavior. 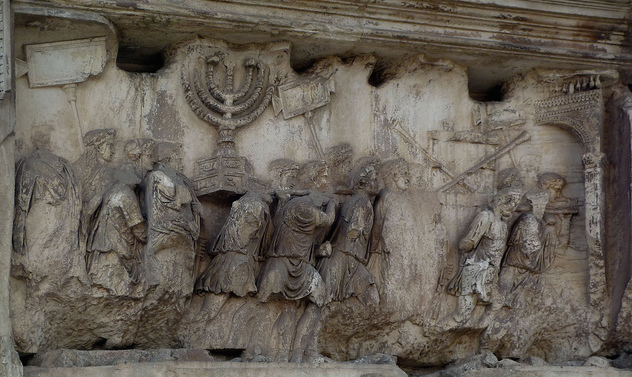 But when the Roman Emperor Titus sacked Jerusalem in response to a revolt of the Israelites in 70 C.E., his armies demolished the Temple of Jerusalem and brought the spoils back to Rome (an event recorded in a relief on the Arch of Titus in Rome, see image above). The loss of the Temple resulted in the end of ritual sacrifice and the priesthood; Judaism became a religion based on the interpretive discussions and practices that were eventually compiled into the Talmud. Sometimes, Judaism is referred to as “rabbinic Judaism,” since centuries of rabbinic interpretation, rather than the Bible, informs Jewish practice. Jewish law, called Halakhah, having been interpreted and re-interpreted over millennia, has changed over time. Even so, religious Judaism operates cyclically, and the linear way that modern historians view history does not correspond to this worldview. As historian Yosef Yerushalmi explained, the Rabbis “seem to play with time as though with an accordion, expanding and collapsing it at will.” Major holidays, such as the weekly Sabbath or the annual Jewish New Year, provide a rhythm in order to structure a distinction between the sacred and the mundane. Other festivals rehearse ancient events, connecting modern Jews to the ancient Israelites. For instance, they mark the reception of the Torah at Mt. Sinai, the exodus from Egypt, the fall harvests, and the Maccabee victory over the Hellenistic Persian kingdom. 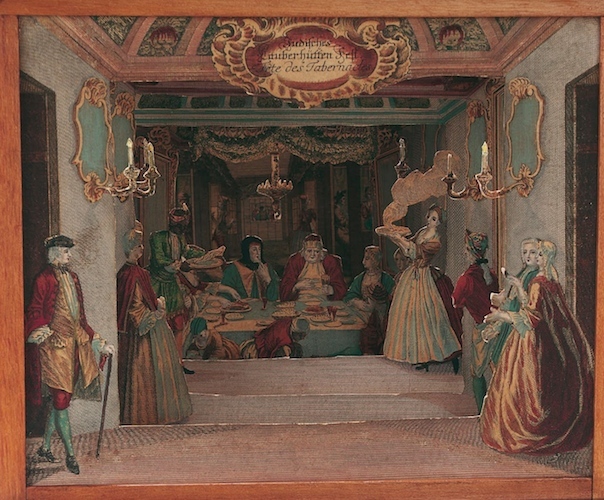 Martin Engelbracht, Diorama showing a sukkah interior, paper, c.1730, Augsburg, Germany, 236 x 297 cm (The Jewish Museum, London). A sukkah is a temporary dwelling built on the holiday of Sukkot, that commemorates the forty-year period when the Israelites were wandering in the desert, living in temporary shelters. It is also a festival of the harvest. Despite the authority of the rabbinic voice in the Talmud, Judaism is non-hierarchical. There is not—nor has there ever been—a single authority; the religion is embodied by a collection of learned voices, which often disagree. We tend to conceive of Judaism as an ancient religion—based out of the Levant where God gave the Israelites the Torah. But an essential piece of the religious tradition was the fact that rabbinical scholars continued to debate, discuss, and re-conceive ancient laws. Ancient tribal divisions, as well as later sectarian movements, including early Christianity, set a precedent for Jewish cultural diversity. Even the Hebrew Bible was not written exclusively in Hebrew; it includes sections in Greek and Aramaic. But the religion is unified under the umbrella of the library of sacred texts, beginning with the Hebrew Bible, through the Talmud, and on to various ritual prayer books and mystical tracts. Judaism the religion, however, is distinct from the Jewish people. While it is clear that not all Jews practice Judaism, all those who practice Judaism consider themselves Jews. In other words, there are Jews without Judaism, but there can be no Judaism without Jews. While the library and calendar unite Jews across the world, there are deep cultural and political divides. Jewish foods, music, literature, language, and interpretive practices vary immensely depending on a community’s ancestry. American Judaism, for example, is divided into movements, or denominations, much like American Christianity. These denominations have committees of rabbis who vote to determine the philosophy and types of observance their communities will uphold. 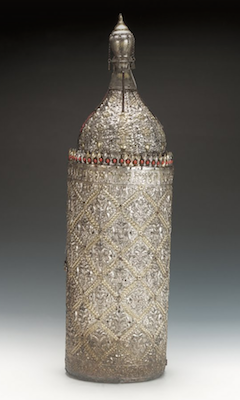 But internal disputes are not only a standard feature of the denominations, they are part of the longstanding tradition of Jewish debate. Yosef Hayim Yerushalmi, Zakhor: Jewish History and Jewish Memory (New York:Schocken Books, 1989). David Biale, Cultures of the Jews: A New History (Schocken, 2002). David Biale, ed. Cultures of the Jews: A New History (New York: Schocken, 2006). Nicholas De Lange,, An Introduction to Judaism (Cambridge: Cambridge University Press, 2000). John Efron, et al. The Jews: A History (Upper Saddle River NJ: Prentice Hall, 2008). Abraham Joshua Heschel, The Sabbath (New York: Farrar, Straus and Giroux, 1951). Barry W. Holtz, ed. Back to the Sources: Reading the Classic Jewish Texts (New York: Simon and Shuster, 1984). Robert Seltzer, Jewish People, Jewish Thought (Upper Saddle River: Prentice Hall, 1980). Cite this page as: Dr. Jessica Hammerman and Dr. Shaina Hammerman, "Judaism, an introduction," in Smarthistory, August 8, 2015, accessed April 21, 2019, https://smarthistory.org/judaism-an-introduction/.